Looking for a new barbecue beef recipe? Try our Beef and Grilled Vegetable Kabobs, done on the barbecue. 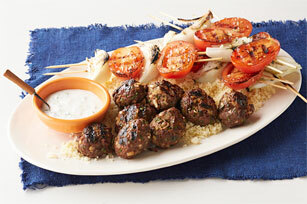 Serve this summer barbecue recipe with couscous. It's sure to become a family favourite! Chop 1/2 onion; set aside. Cut remaining onion into 8 wedges. Mix oil and 1 tsp. garlic in medium bowl. Add tomatoes; toss to evenly coat. Thread 2 each tomato halves and onion wedges onto 2 parallel wooden skewers. Repeat with 6 additional skewers and remaining tomato and onion pieces. Reserve 1/4 tsp. of the remaining garlic. Mix remaining garlic with chopped onions, meat, parsley, barbecue sauce and cinnamon just until blended. Shape into 8 (1-inch-thick) oval-shaped patties. Grill patties 6 min. ; turn. Add skewered vegetables to barbecue; grill 6 to 8 min. or until patties are done (160ºF) and onions are crisp-tender, turning skewers after 4 min. Meanwhile, bring broth to boil in medium saucepan on side burner of barbecue. Remove from heat. Stir in couscous; cover. Let stand 5 min. Mix dressing, remaining garlic and mint until blended. Drizzle dressing mixture over meat. Serve with couscous and vegetables. Substitute 1 red pepper, cut into 8 chunks, and 1 large zucchini, cut crosswise into 8 chunks, for the tomatoes and onions. If your barbecue does not have a side burner, heat broth on stove top instead.